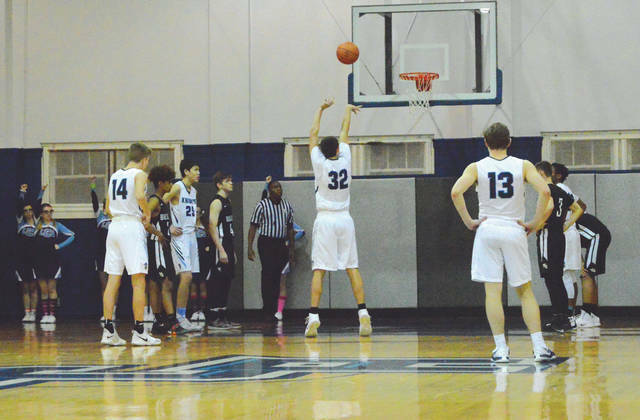 Legacy Christian Academy senior Erik Uszynski (32) was selected to the 2019 Division IV All-Ohio Special Mention team, March 19, by a statewide media panel of Ohio Prep Sportswriters Association members. Uszynski (32) was instrumental in the Knights’ Metro Buckeye Conference title this season. 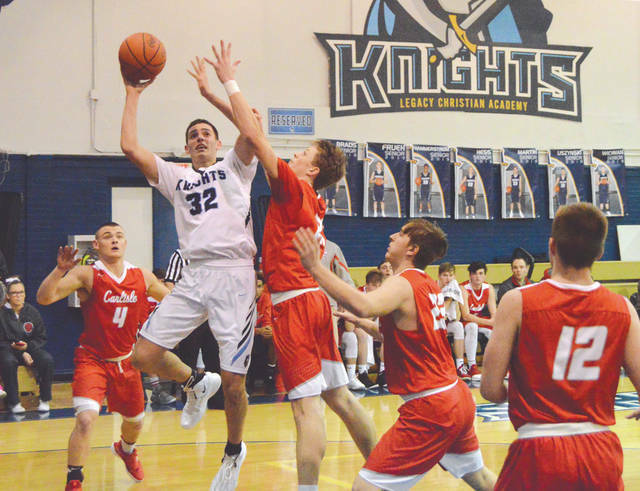 XENIA —Legacy Christian Academy senior Erik Uszynski was named to the Division IV All-Ohio Boys high school basketball team on Tuesday, March 19 by panel of Ohio Prep Sportswriters Association members. Uszynski, a 6-foot-4, 200-pound senior forward for the Knights, was ranked in the Metro Buckeye Conference’s top-5 in scoring (16.1 points per game), assists (3.4), field goal percentage (58 percent), rebounds (8.7), and blocks (3.1). His numbers in blocks and field goal percentage led the league. LCA Head Coach Brad Newsome was proud of his senior’s accomplishment as well. Uszynski had just returned from a visit to Trevecca Nazarene University in Nashville, Tennessee when he learned he had been selected. He said he is considering either TNU, Biola University (Calif.) or Capital University in Columbus to play college basketball next season. Legacy Christian amassed a 20-4 season, winning the outright Metro Buckeye League title with a 13-1 mark. The Knights were voted as the Division IV southwest district’s No. 1 seed and claimed a convincing opening round 75-35 win over East Dayton Christian before a 49-46 upset loss to Newton in the second round. Metro Buckeye Conference online records go as far back as the 2008 season. Legacy’s 20 wins are the most for the school during that span. A complete listing of the Division III and IV boys All-Ohio selections can be found at xeniagazette.com/sports. The Division I and II All-Ohio teams are scheduled to be announced on Wednesday, March 20. The Ohio Mr. Basketball Award winner will be announced Thursday morning.